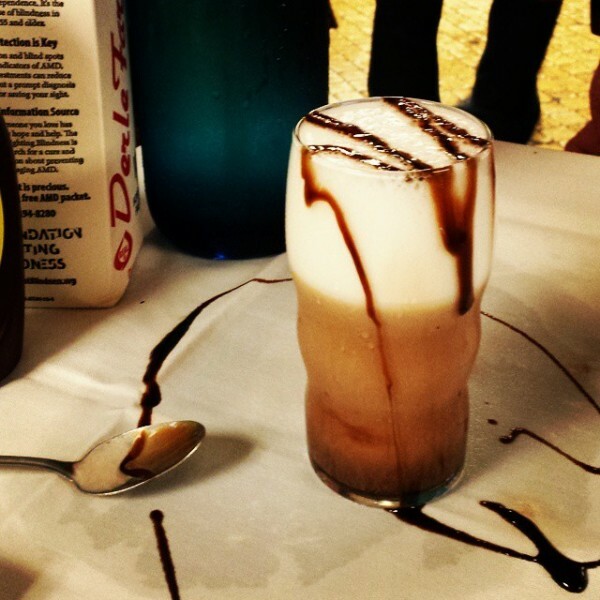 Sammy’s Romanian table side egg cream! I love egg creams! Whether crafted from vanilla (Manhattan style) or made with Fox’s U-Bet chocolate syrup (Brooklyn style) they are a favorite treat with a long history. Traditionally they contain no egg or cream, just the perfect ratio of frosty cold milk, bubbly seltzer and sweet syrup. The inventor of this NY iconic beverage remains a mystery but mentions date back to the 1880s, with one possibly theory that it was based on a try at recreating a favorite French drink enjoyed by Yiddish theatre poineer Boris Thomashevsky in Paris. Another popular theory is it was created on accident by Louis Auster. In the 1890s Brooklyn candy shop owner Louis Auster sold hundreds of egg creams a day, he even had his own secret recipe for chocolate syrup that he took to the grave. Today, Sammy’s Romanian, my favorite NYC kitsch palace, turns this simple classic into a table side presentation, ending with a drizzle of Fox’s U-Bet swirled on your table. Eisenberg’s, one of NYC’s oldest deli counters serves countless egg creams paired with their deli sandwiches to happy customers daily. Down in the East Village Gem Spa newsstand is a stop on more than one food tour searching for the perfect egg cream! 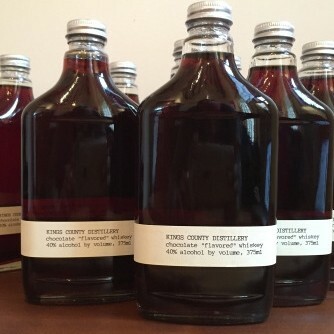 When I first tasted Kings County Distillery’s chocolate corn whiskey I immediately though of trying my hand at egg cream greatness, but, with a boozy twist. This unusual whiskey, made in Brooklyn, is crafted from a blend of 80% NY state organic corn and 20% malt barley. After distillation it is infused with ground cacao bean husks from Mast Brothers Chocolate factory, also in Brooklyn. Smooth and rich it tastes like a bitter, silky, dark chocolate, without any sweetness. I honestly didn’t think I’d ever have a need for chocolate whiskey, but, this is truly a phenomenal tipple that is perfect on its own or for mixing. Combining the rich chocolate flavor with vanilla I found adult egg cream heaven! 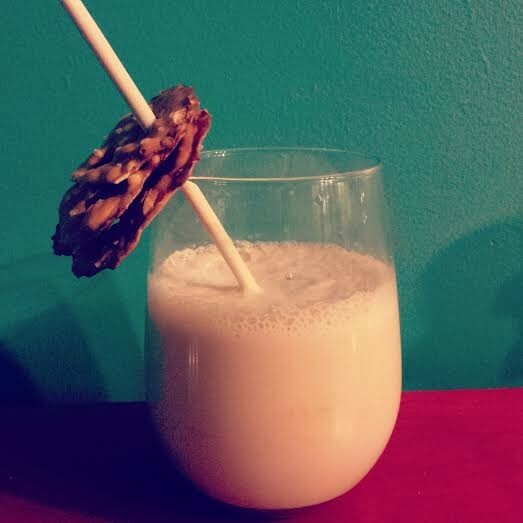 Serve the traditional way with a salty pretzel on the side and enjoy a classic with a twist! Blend milk, whiskey and 1 tablespoon syrup in fountain glass. Pour in seltzer, stir and drizzle additional syrup on top.